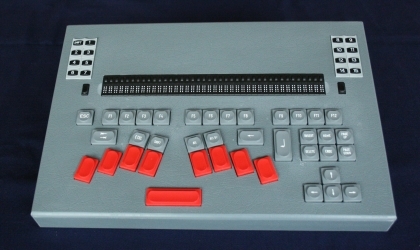 The HERMES is connected to the keyboard input of the computer and to its serial input port. The ordinary keyboard may be connected simultaneously. On the Braille keyboard there are 8 oblique-angled Braille-keys and one space-bar. These few keys replace easily the entire ordinary keyboard. To some special computer functions, like F1 - F12, Ins, Home, Arrow-keys, and so on, it is easier with individual keys. That is why the keyboard for these functions is supplied with 30 ordinary keys as well,. The Braille display is a 40 characters piezo-electronic Braille display with cursor routing keys. The HERMES is turnable. The turned position gives the user a proper support for the hand. At reading of long text. this position is preferable. The HERMES uses the program JAWS® to scan the screen. The 16 extra keys of the the HERMES are defined in JAWS. The HERMES suits any IBM-compatible computer.